I would love to hear from those in management, in coaching or who have had the experience of having a tremendously talented star on your team who is also a constant screwup. We’ve all been there — the Prima Donna, the Rock Star who demands special treatment and, frankly, is worth it for the value he or she brings to the organization. You accommodate the demands, because this person does things few others can. When this person sees the damage his screwups do to the team, he resolves to change. The resolution can be quite sincere, and actually work for a while. During this honeymoon time, things are perfect: this star is performing and the team is well oiled. But a leopard does not change his spots. The inevitable screwup happens, and the damage to the team culture and spirit is immense. What do you do? 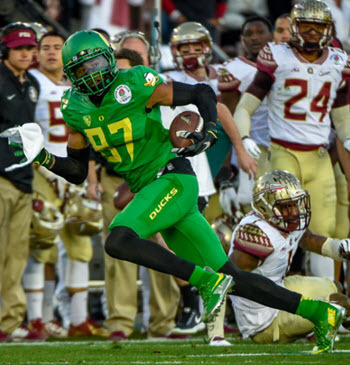 What does coach Willie Taggart do with Darren Carrington? But boy — his talent! This receiver was a star in one of Oregon’s biggest football wins ever: the National Playoff win against Florida State. And he did it as a freshman. His game-winning catch at Utah last year was simply unbelievable — he caught the ball over his shoulder and kept a foot in bounds? Holy Crap. He says all the right things to build the team unity and get a fresh start, and then he catches three TDs in the 2017 Spring Game — clearly head and shoulders better than anyone else the Ducks have in the receiving corps. In a typical game this fall, the opposing defense will have to follow Royce Freeman on a power-play threat to one direction, while keeping track of Tony Brooks-James on a jet sweep going the other direction. This will leave Carrington one-on-one with the opposing corner: the dream isolation. He and quarterback Justin Herbert could go absolutely crazy chewing up the Pac-12. Carrington was suspended for the National Championship Game and six games of 2015 for failing an NCAA drug test. 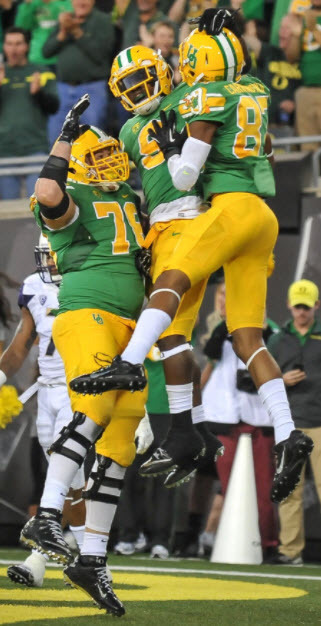 In the off-season, he was accused of breaking the arm of a UO student. WTH? Now, we are saddened to learn that he has been suspended from the team for a DUI last Saturday night, after bashing a pole at a McDonald’s drive up window. OMG. It is all a fascination to me due to my extensive experience with the subject, and I still do not have a solution that I like. (I want it all: a star and a well-oiled team. But that has not been reality.) I have had incredibly talented writers on the team, who always wrote wonderfully insightful articles in the areas of recruiting, editorials, and even analysis — but who also sucked the life and energy out of the editors and me in dealing with them. There was a lot of celebrating when Carrington played. But they brought huge readership with their articles, and no surprise, as they were good. It has just happened again to me. One of the most recognizable names on this site has also been the ultimate prima-donna, narcissistic 12-year-old. Because he didn’t want to compromise — even in the smallest way — on his demands, which sucked up so much of my time, he has quit for the final time. This guy is truly the biggest FishDuck.com star, who has contributed so much — but I cannot meet his demands any more. Geez, Coach Taggart! Do I ever understand your Carrington dilemma: I’m living it too! One thing I love about this site (besides having fun writing) is the wisdom and feedback from the primarily professional men and women who read it, and often teach me insights I haven’t thought of on my own. I would love to hear your stories, your solutions and your failures in dealing with this “star” problem that every organization deals with at one time or another. This site has excelled at attracting those who like to learn or who like to mull over a topic and discuss it. Fortunately we also attract older, experienced and skilled professionals who like to write, and who join us to ponder out loud in the articles they contribute to FishDuck.com. This is a classic subject for us to learn from each other, and I’m sure Coach Taggart (as well as I) will take notes on your feedback. For you coaches who read this site … how did you deal with this on your team? What does Willie Taggart do?